They say the winds of Menorca can change a person’s personality. Menorca certainly has a very strong impact on visitors. The "minor" island, as it was called by Romans, has an almost virginal interior (compared for instance to the "major" island, Mallorca) and shows interesting remains of its old history. On the other hand, there are beaches and lonely bays around it at a length of 216 kilometres. An ideal resort for all those who are looking for true relaxation. Menorca is very different and a bit more laid back than the other Balearic islands. 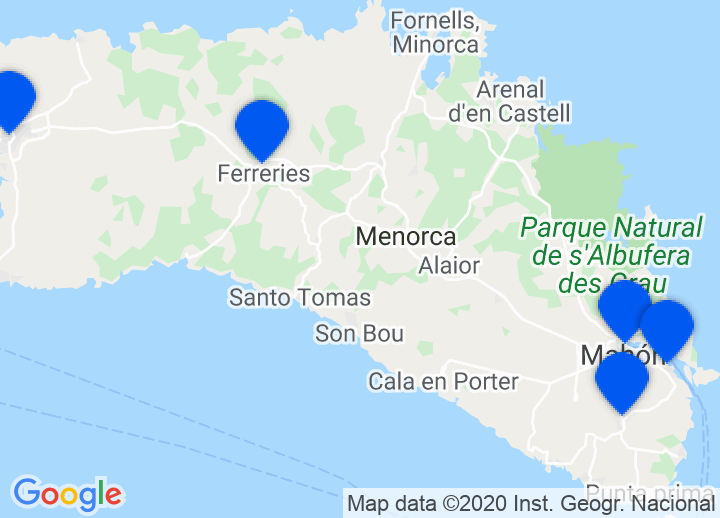 Choose from our wide selection of Menorca hotels, including romantic fincas, seaside hotels, bed & breakfasts, amongst others. Whatever your taste, we’ll help you find that perfect getaway. The historical centre of Alaior (Menorca), with its narrow lanes, whitewashed walls and manor houses of the 17th and 18th century is certainly worth visiting. The surrounding area provides some very interesting prehistoric remains such as the taula and talayot of Torralba, and the settlement of Torre d'en Gaumés. The Balearics have a rich gastronomic heritage and each island provides its own subtle variation on a cuisine that may be considered Mediterranean. Fish and seafood based dishes are very important, given they are in plentiful supply and of great quality along the coast. La caldereta de langosta (a lobster dish) is the most outstanding. Other typical dishes are rice with lobster and tuna with mayonnaise. In fact, mayonnaise was probably invented in Menorca. Menorca produces gin as well.